Hey guys my name's Clay. I'm new to the Florida Sportsman community and this is my first post. I've been offshore 4 times in the past 7 days and have caught a variety of fish so I'll go through them day by day. Put out the spread at 645 AM and trolled in the shape of an S from 90 to 250 feet. Kept the lines out for 3 hours without even a single hit so we pulled them in and ran offshore looking for dolphin. We got about 10 miles out and ran across a big, 8-foot long log floating in the water. When we passed it I didn't see any dolphin but i did see lots of bait and a couple tripletail underneath it. I messed around for about 20 minutes trying to free gaff one of the tripletail (I've successfully done so previously) and the dolphin show up. They were about 20 of them and they were larger than the typical schoolies. Although they were being picky we managed to catch 3 of them on whole dead sardines before calling it a day. At 630AM we started our 25 mile run straight east out of PE looking for dolphin. Found birds diving but could not get on the fish before they (and the birds) were moving. There was no weed or floating debris to be found. After a couple hours of running and gunning (and not succeeding) I noticed a potential deepdrop spot that looked promising on our fishing charts. Since we weren't catching fish we decided to give the potential spot a drop. On the first drop the bait hit the bottom and the rod immediately bent over. We ended up pulling up a 23 pound barrel fish from 1200'. 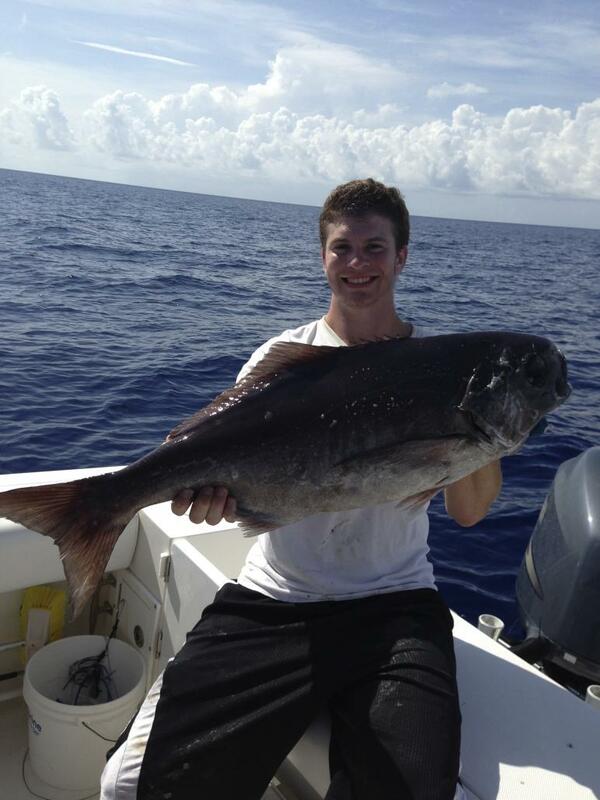 We dropped three more times after that and got a 15-25 pound barrelfish on each drop. Quite the turn around for the day. After we pulled up the 4th barrelfish the storms started closing in on us and we called it a day. Trolled the reef (85' to 130') for a few hours in the morning. Probably caught about 20 bonitos, couldn't get away from them. Also managed to catch a very large barracuda and a decent sized kingfish on a drone spoon swimming behind a planer. Decided to catch some sleep in the morning and catch the dusk bite. We trolled in about 200' from 545PM to 745PM. Within the first 30 minutes we managed to pull in 3 blackfin tuna. Shortly after the third tuna, as I was resetting my spread, I witnessed something I'd never seen happen before. One of my lines was skipping on the surface, probably 5 yards behind the boat (about to be deployed) when a 10 pound cow dolphin came out of nowhere and slammed it. Not even kidding this fish devoured a lure almost within gaffing distance of the boat. Anyways, as I pulled her up I saw she brought a few friends. Pitched out a bonito chunk on a spinner and we got a second one. The school stayed around long afterwards but we couldn't get anymore takers. 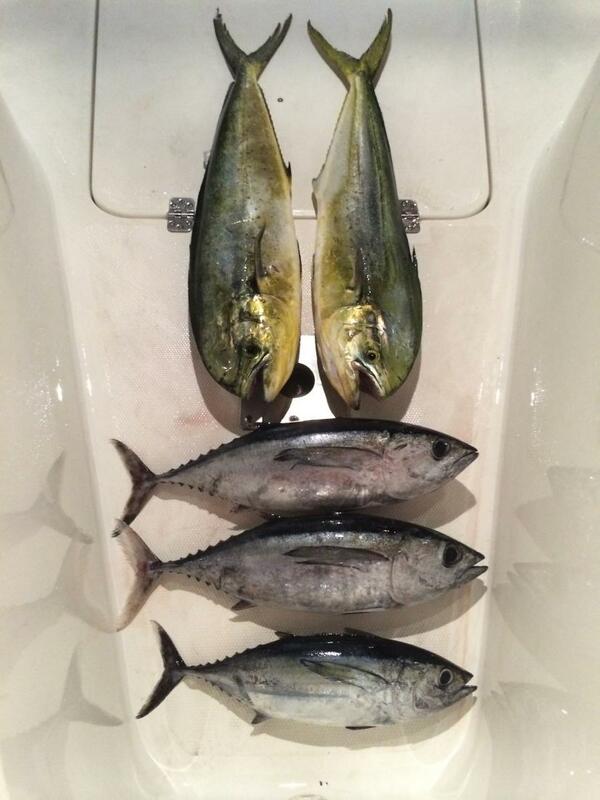 We ended up with 3 blackfin and two dolphin, not bad for a couple hours before sunset. Not sure if the pictures I uploaded will be visible but I hope it works. Also I wanted to upload a picture of the kingfish but for some reason when I tried to upload the file it had a red x next to it and wouldn't let me upload it (even though its a jpg), maybe its too large of a file? Anyways, I hope you guys enjoyed the reports. Great report and nice pics! Welcome to the forum captain! I have never purchased fish at the market or restaurant and I never will. Nice reports Clay!!! Welcome to the forum...look forward to seeing more reports from ya!!! 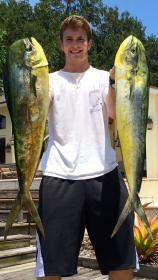 Great job bro, those are some nice fish!!! welcome to the forum.